When Museum of the Bible opened this November in Washington, DC, one of the featured exhibit, illumiNations: Global Bible, presents an immersive experience for how the Bible has been translated into over 2,000 languages, and yet, there are thousands more who currently don't have the entire Bible in their own language. Here's another way to look at the current status: there are ~6000 languages globally, ~2000 have the Bible, ~2000 are in the works, and ~2000 don’t have the Bible yet . While most of the other exhibits look into the past, this is the one exhibit that gives visitors a perspective of what the future could be. 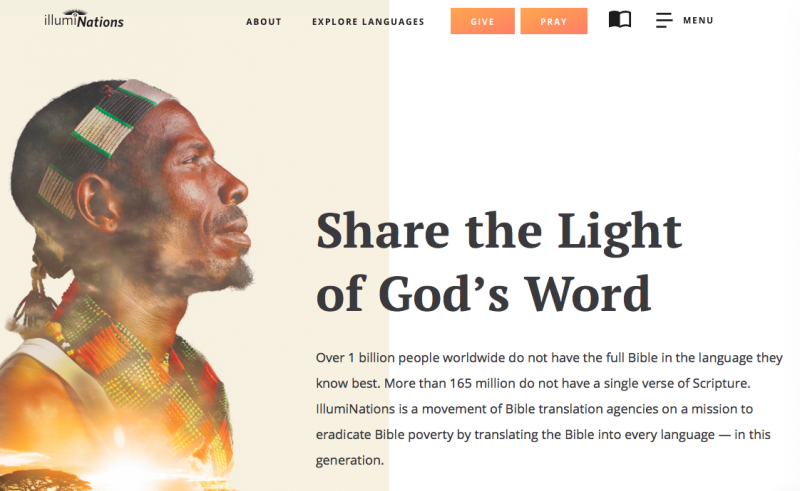 illumiNations has brought together an alliance of the world's largest Bible organizations to coordinate their work on this bold mission: to make the Bible available to everyone in the world. They're aiming that by 2033, 100% of the world with access to at least a portion of the Bible and 95% of the world will have the full Bible. This photo from the exhibit refers visitors to the project website at illumiNations.Bible for more information. illumiNations.Bible shares these statistics about the urgent need for Bible translation: over 1 billion people worldwide do not have the full Bible in the language they know best; more than 165 million do not have a single verse of Scripture. Visitors are invited to pray and to consider supporting a specific language project; you can be a part of making a big difference. You can actually support the project right now at illumiNations.Bible; don't wait until you get to visit the Museum. WASHINGTON, June 21, 2017— When the forthcoming Museum of the Bible opens this November in Washington, D.C., the fourth floor of the museum will be entirely dedicated to exploring the fascinating and often harrowing history of the world’s best-selling, most controversial book of all-time. The History of the Bible floor will completely immerse guests in the Bible’s journey through time, technology and culture. Beginning as a collection of oral traditions and writings accessible to only a select few, the Bible ultimately underwent major changes in form and language which allowed diverse communities from around the world to embrace the text and make it the most widely read in history. Part of that journey will be presented in the illumiNations: Global Bible Exhibit, which will celebrate the Bible’s ever-increasing accessibility across the world in over 2,000 different languages to date. 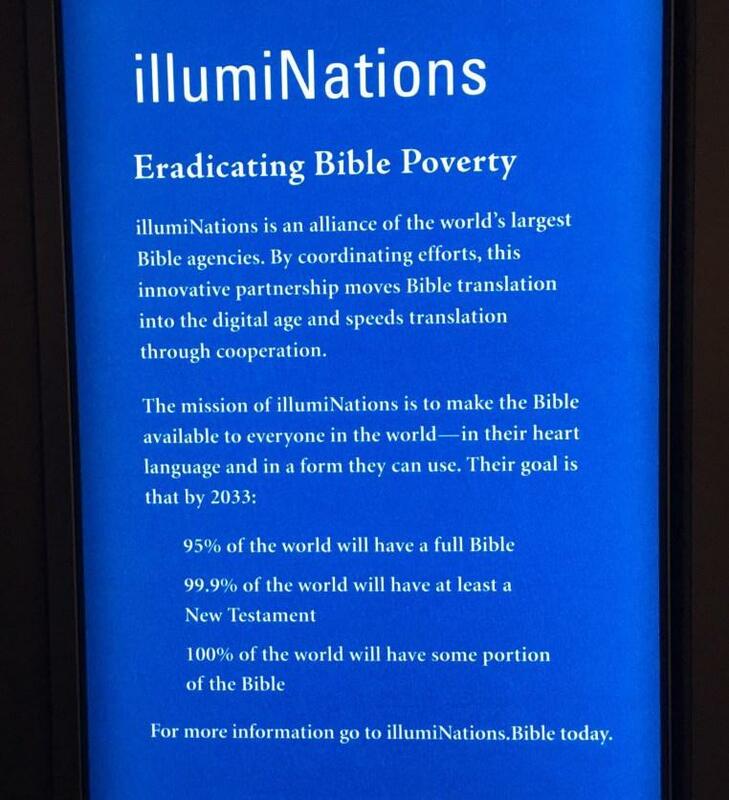 The illumiNations: Global Bible Exhibit, developed alongside Every Tribe, Every Nation, will shed light on the sheer scale of biblical translation into thousands of written languages while simultaneously depicting how many languages are yet to have a translation of the Bible. Already, more than 600 Bibles in various languages and dialects, have been collected through the Museum’s relationships with organizations such as Wycliffe Bible Translators, Biblica, SIL International and many more. Now, Museum of the Bible is asking organizations and people from all-around the world to help the institution collect the remaining languages needed to complete the exhibit.